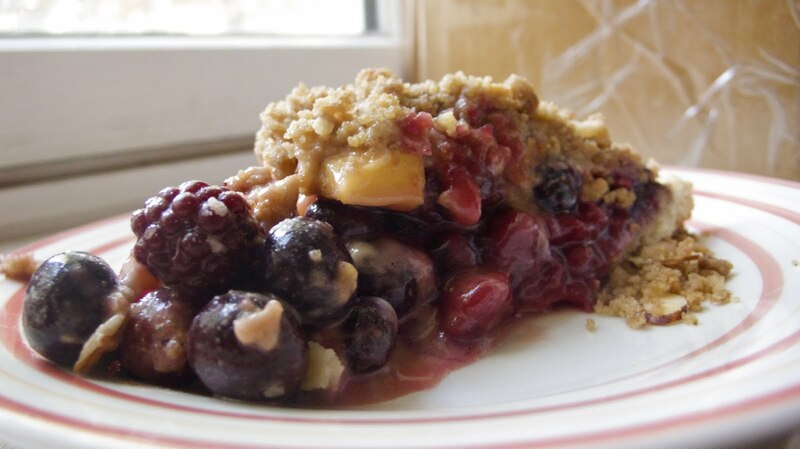 Since yesterday was the hottest day of the year (i think it got up to 108° – which as a LOST fan obviously holds some special significance…) I decided that i should turn my oven on to 400° and make a pie. 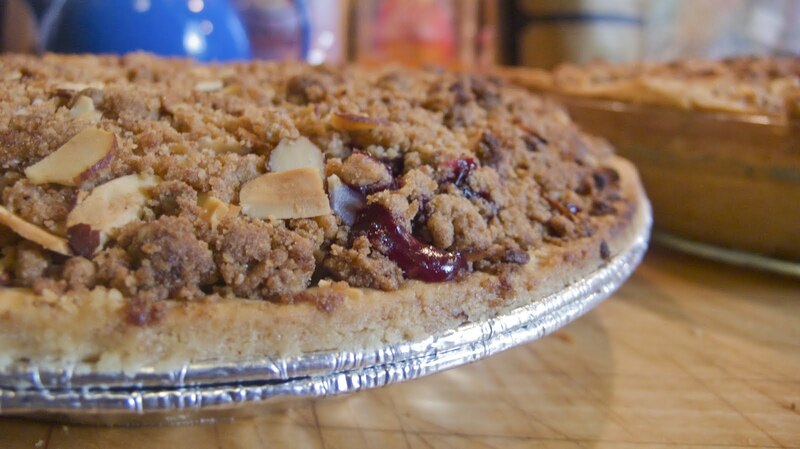 An extremely Delicious, gooey, oozing pie filled with very delicious Ingredients. it all started because i found a Peach in my fridge. 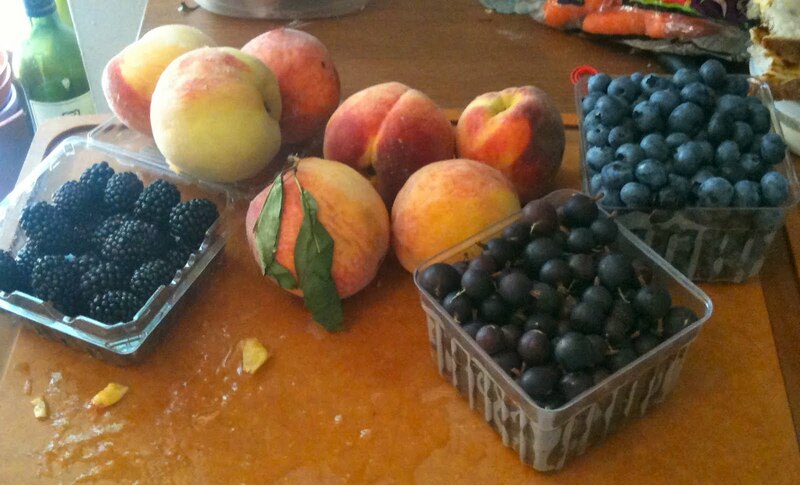 Peaches are my absolute favorite fruit, and after eating it for breakfast, i just had to have more. I hadn’t baked anything in a while, so i figured i would make a pie. but that’s not all i found in the fridge, there were a few blackberries also! 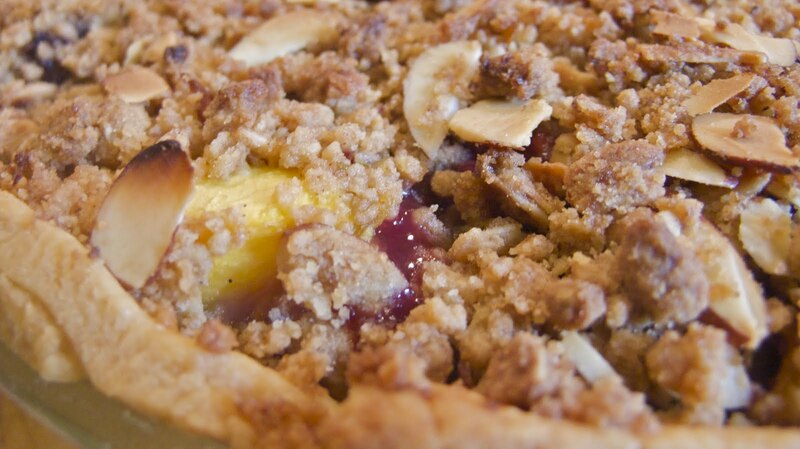 This got my mind gears moving and i decided that i would make a Peach and Blackberry Pie. 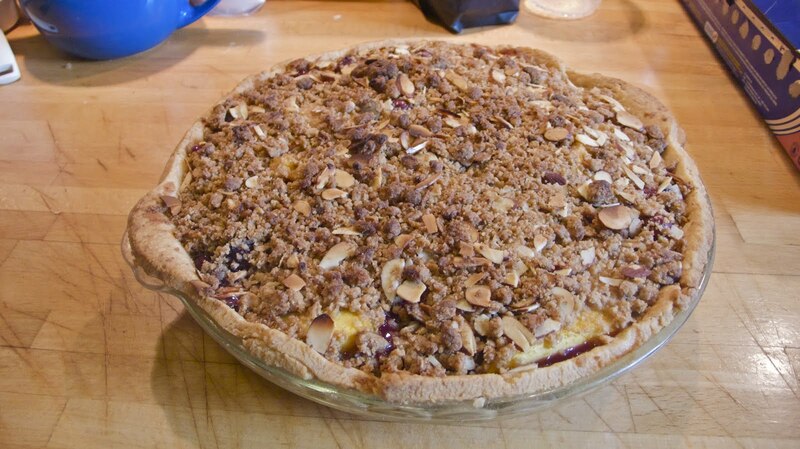 Here’s what you will need to make this pie – and you should definitely make this pie. once the dough has come together in a flaky ball, take walnut sized pieces smear them with the heel of your hand against the counter. this will finish the mixing of the butter and the shortening. gather all the dough together and wrap it up and chill is for an hour. Peel and slice the peaches (this is a tedious, messy operation), put them in a bowl with the rest of the fruit, and add all the rest of the ingredients, and mix it up gently, as you don’t want to destroy the lucious berries. Now, since that probably took about an hour, take the chilled dough out of the fridge and roll it out on a floured board, and place it into your pie container. Add the filling to it. don’t worry if its overflowing a little bit. LET IT OVERFLOW! 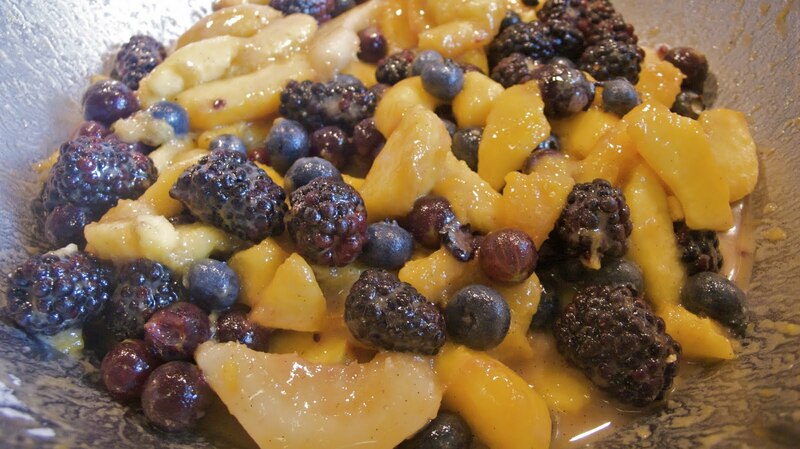 put this in the fridge while you make the crumble. add all ingredients together in a bowl and mix (with your hands!!!!) until crumbly. place it on a tray and cook it first for 20 minutes uncovered. then cover with tinfoil and bake it for another 25 minutes. finally remove the tinfoil and bake it for a further 15 minutes. Remove from the oven and let it cool for 30 minutes. and save some for somebody else! I made this, and it was fabulous! I thought the rum was going to be too much, but nope! It was sweet and delicious! 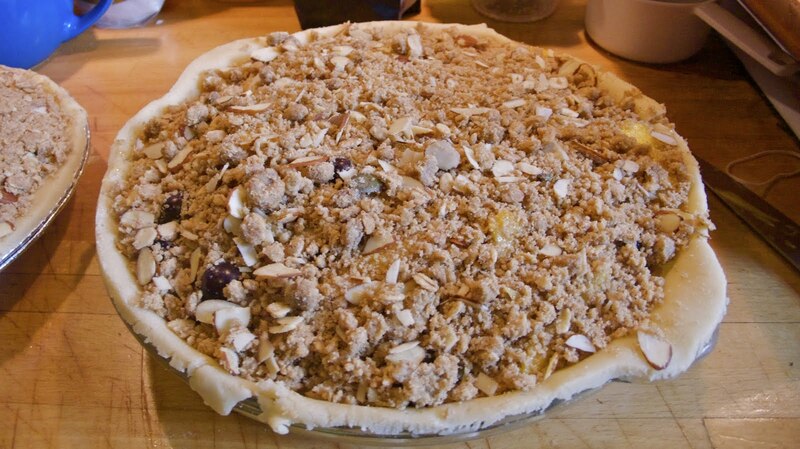 I used a pre made organic pie crust and then put together the filling and crumble myself. Yum!